[Ended] Lifetime license deal! For limited copies only. 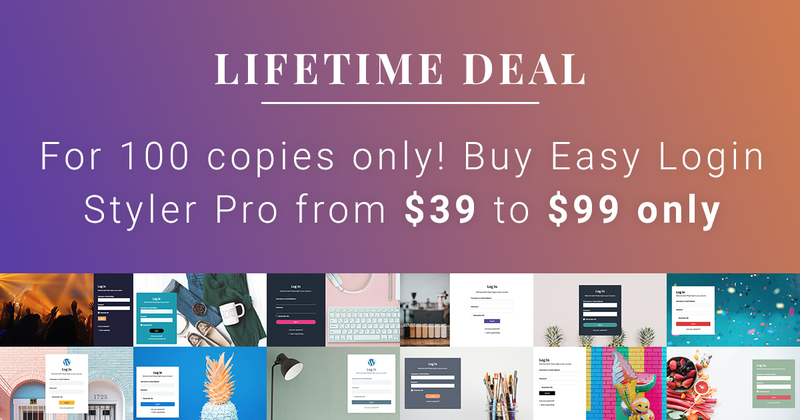 A few weeks ago, I released the Easy Login Styler Pro plugin and got a lot of suggestions and requests for a lifetime license deal. Our main goal is customer satisfaction and we value feedbacks a lot, so we began planning and working a lifetime deal out. Now, finally, here it is! 🙂 Please read the details and terms below. This promotion will run for 100 licenses only. This is to ensure good plugin support. So, grab your copy now while it’s available. The unlimited sites activation will be for your sites and your clients’ websites only. You can’t give the license/plugin for free. If you have any questions. Just let us know anytime. 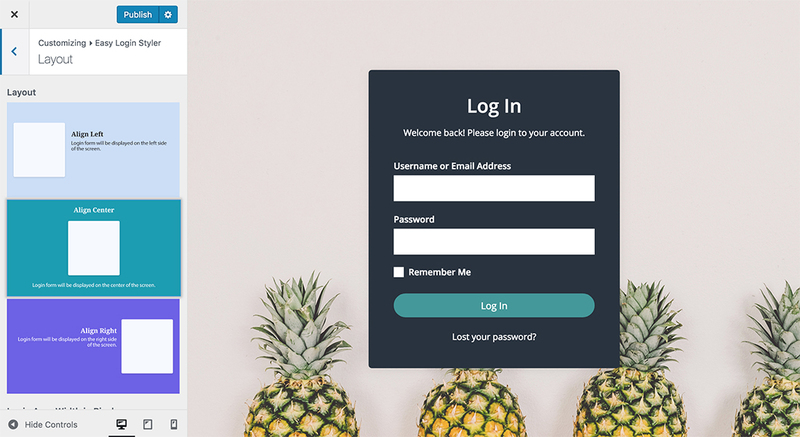 After countless hours of development and testing, I’m very excited to announce our brand new plugin, Easy Login Styler Pro. 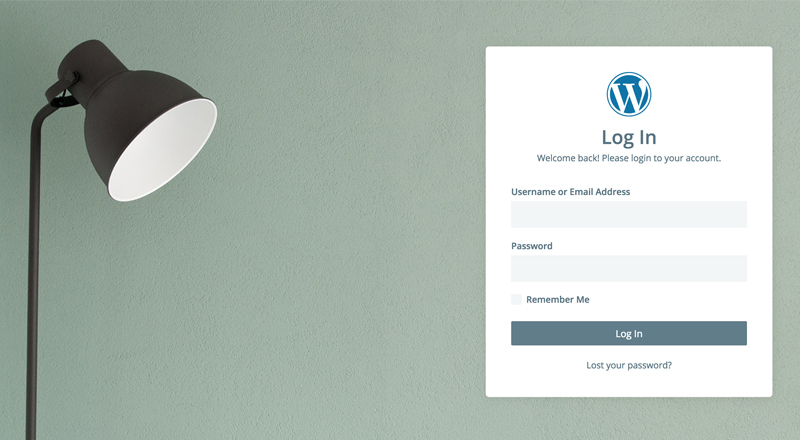 This WordPress plugin will let you easily create a beautiful white label WordPress admin login page. 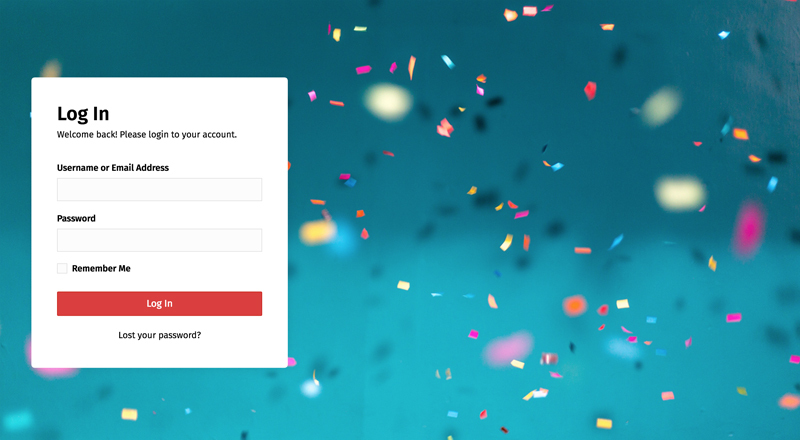 Seriously, you can have your dream login page in just a few seconds! Looks pretty sleek, isn’t it? The teaser video above previews the predesigned templates below. You’ll just have to select which one you think matches the most with your website’s branding. Below are the Easy Login Pro features you’ll sure get worked up about! 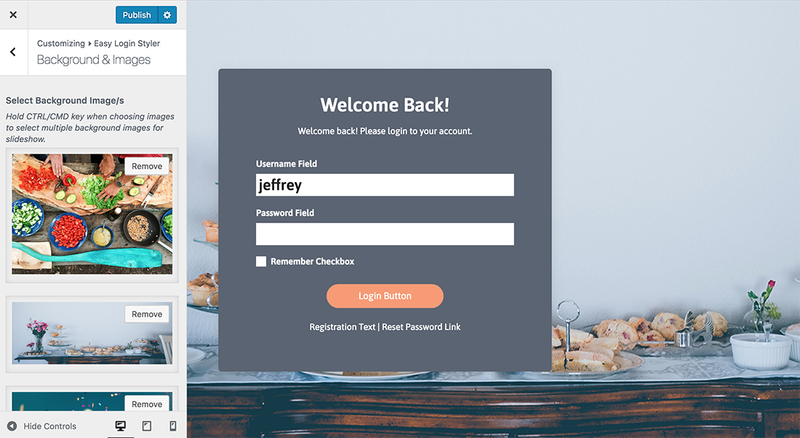 Each admin login template above has styling unique from each other. Select the perfect one for your website; then, you just have to change the color and background image/s if you want to. 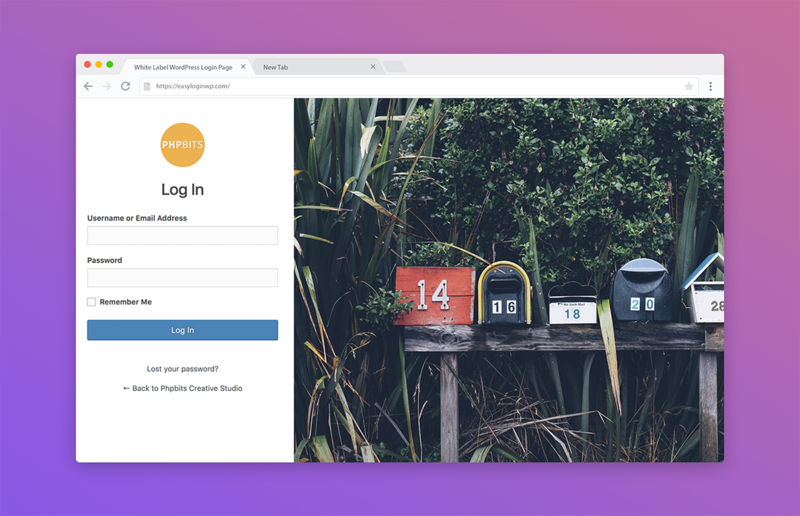 Make your white label WordPress admin login page more stylish by using background slideshow. When uploading the background image, just select multiple images, and it will automatically be displayed as slideshow. No need for extra checkbox 😉 Easy! Love the template but you want it right or center aligned? Easy Login Styler Pro also provides easy selection for layouts. Powered by customizer, you’ll see the changes live for you to select the perfect layout for your website. 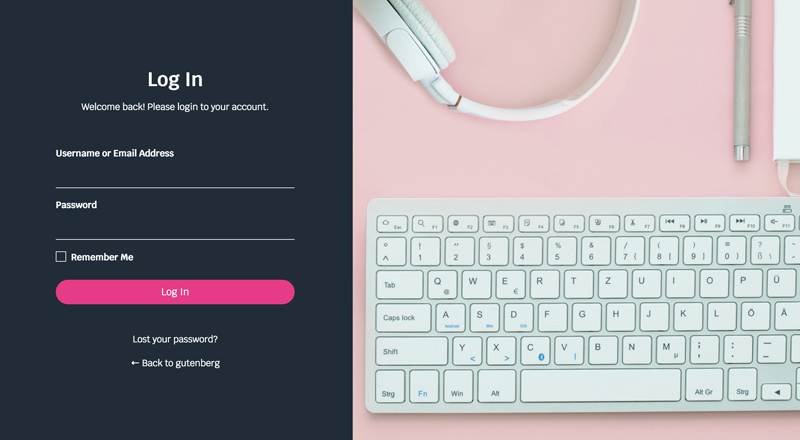 Color scheme is one of the most critical for branding, so we’ve provided an easy way for you to match the white label WordPress admin login page to your brand. Using color pickers, just select the right color and see the changes live, too. Easy Login Styler Pro provides the following styling options. Add your logo to have a complete white label login page. You can also customize the logo shape, size, and alignments. You’ll have all the controls you need. That’s it for version 1.0! I hope you love the features as much as I do. There’s a lot of plans for the upcoming features, too! If you have any suggestions, just leave them through the comment form below. 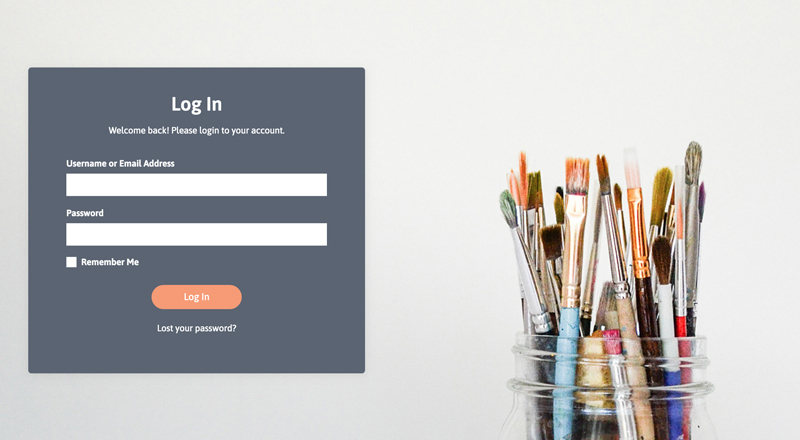 Get Easy Login Styler Pro now and start customizing your WordPress admin login page! Use coupon code GETEASY to get the 30% introductory discount. Valid until October 31, 2018 only. 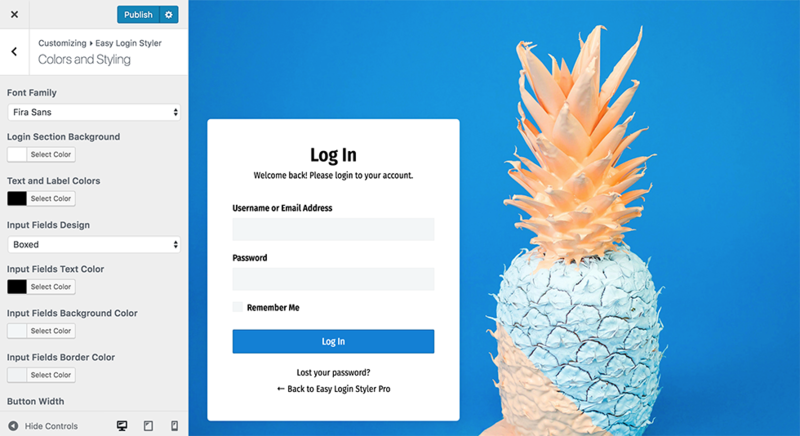 This article is the complete guide on how to use Easy Login Styler Pro for setting up a WordPress login page that perfectly matches your brand. 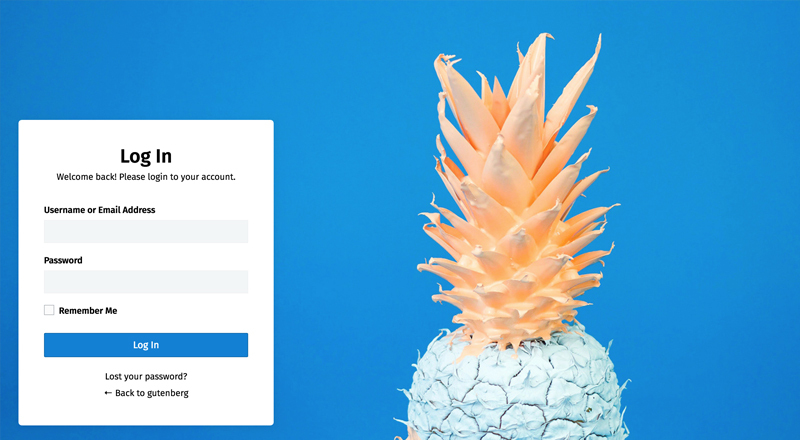 You’ll now have the perfect option to white label the admin login page easily. 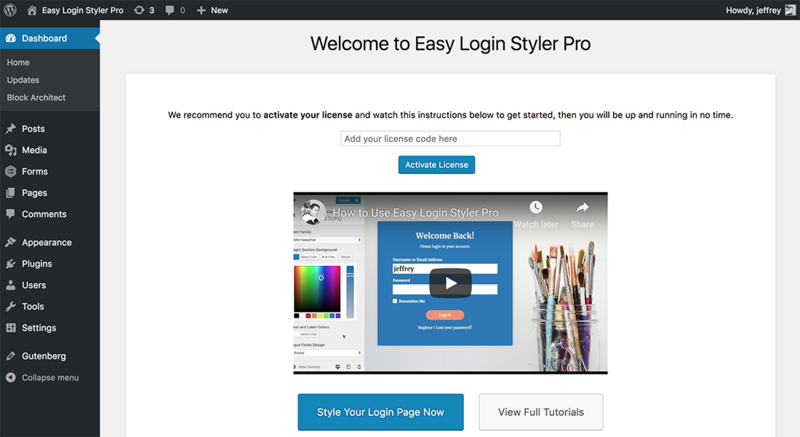 After getting your copy of Easy Login Styler Pro, proceed to installation and plugin activation. You probably already got into the plugin’s welcome page after activating your license code. Perfect! Go on to the next step. 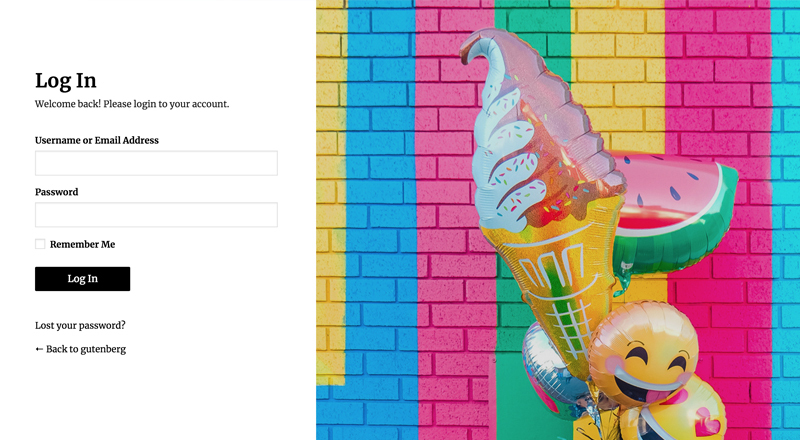 Click the Style Your Login Page Now button on the welcome page (check the image above. ) You will be automatically redirected to the template selection option powered by WordPress Customizer for you to see the layout previews before saving it. 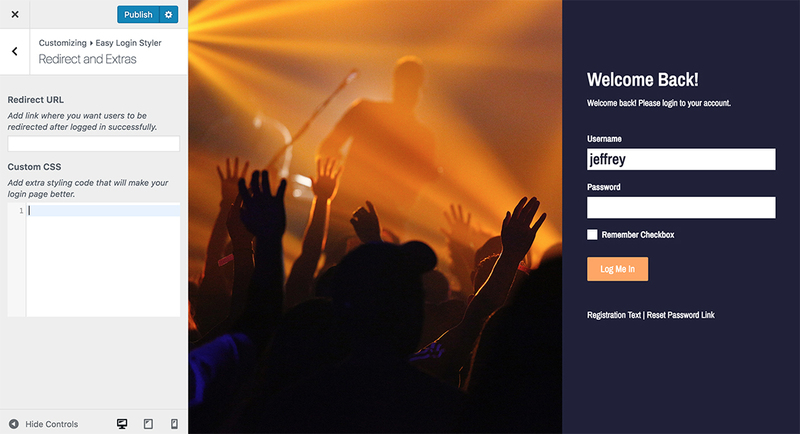 We’ve provided 10+ predesigned login themes that you can choose from. Each one of them has unique design, so choose the one that will best fit your website. If you like a template that doesn’t have the colors that match your site, don’t worry. This will be solved easily with the next step below. Congratulations on selecting your templates by the way. Now let’s proceed to matching the color scheme with that of your brand. Just navigate to Colors & Styling settings on the customizer. Aside from color pickers for styling, you’ll also have option to change the login page’s font family. Navigate to Background & Images. If you want to use your own image as background, just click the Select Images button to upload one; then use the image. Selecting multiple images will automatically create a background slideshow. Try it! It’ll be really cool! Not really impressed with the form position after adding the image and think it would fit better if you centered or right aligned the form? Just go to Layout settings and select which one fits the best! Just a note, centered layout is not available in all templates. Your branding won’t be complete without your beautiful logo on it! Simply upload and customize your logo on the Logo settings. Pretty easy! If you want to change the Log In text or add custom descriptions, we’ve provided the best option to easily change them. Just go to Titles & Labels option to change text display. You can also change the alignment on this settings page. Lastly, if you want to redirect users to a welcome page after login, just set the redirect url under Redirects & Extras. In this settings page, you can also add custom CSS code if you are up to it! If you need any help on customization, just let us know and we’ll do the best we can to help. That’s all! 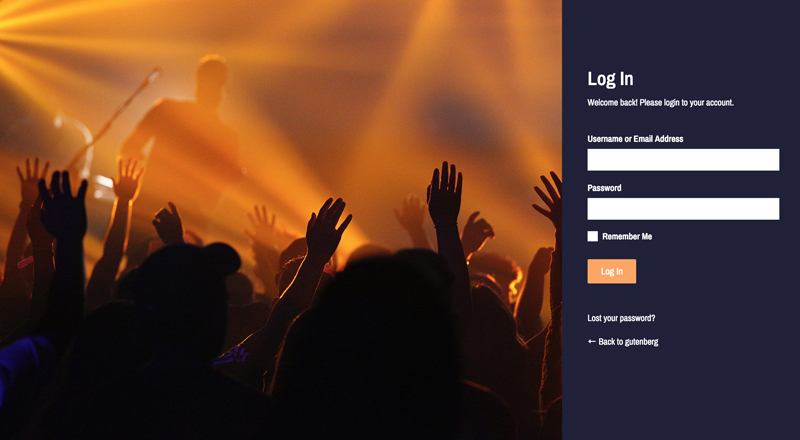 You now have the login page you wish you had before. If you have any questions just use our support page and we’ll get back to you immediately. 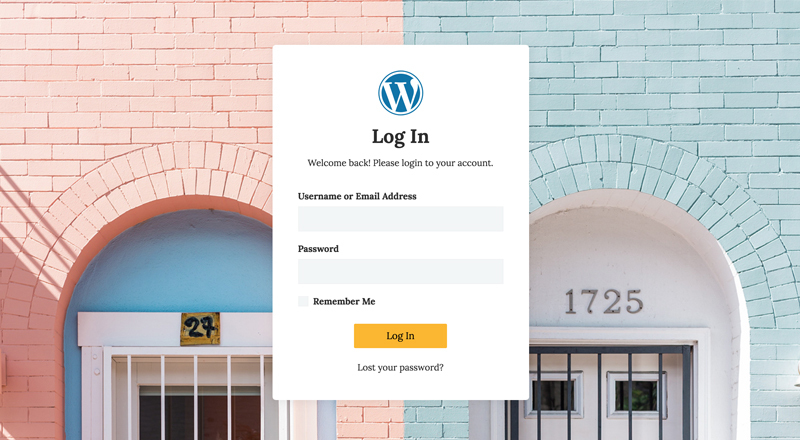 In this article I will demonstrate how really easy it is to white label WordPress admin login page using the Easy Login Styler plugin. This won’t take long, so let’s get started. Go to Plugins > Add New and search Easy Login Styler using the search box. Click Install; then, activate. After activation, you’ll be redirected to the welcome page with video instruction on how to use the plugin. After watching the video, click Style Your Login Page Now button. 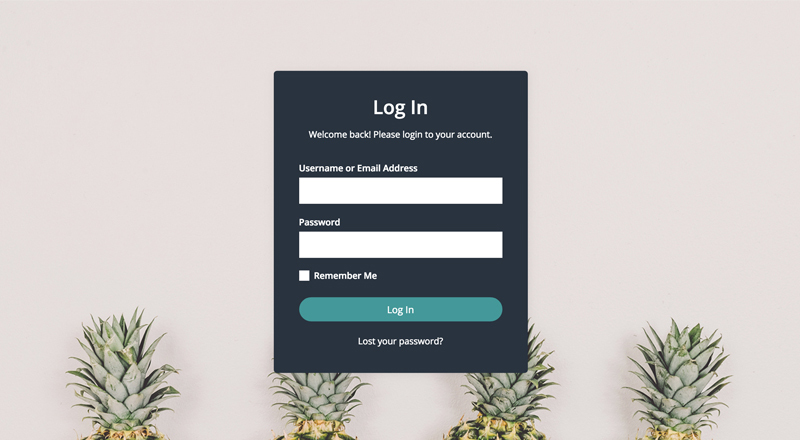 You will be redirected to Settings > Easy Login Styler, which will give you options to upload your website’s logo and change the default login background image. You can also add Custom CSS in case you want to. That’s all! 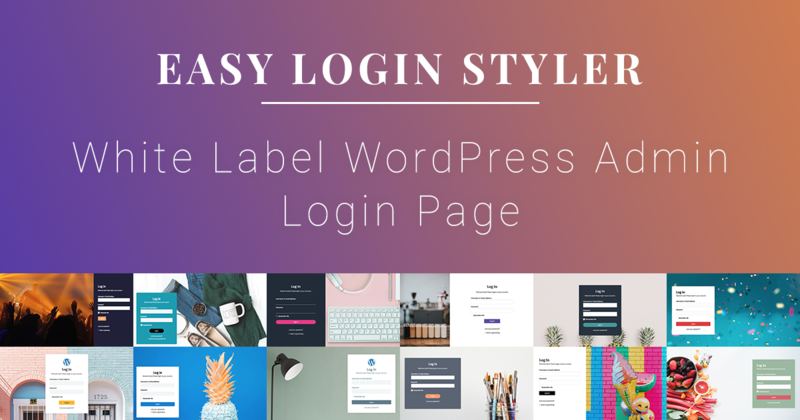 Pretty easy as the name says “Easy Login Styler for WordPress”. 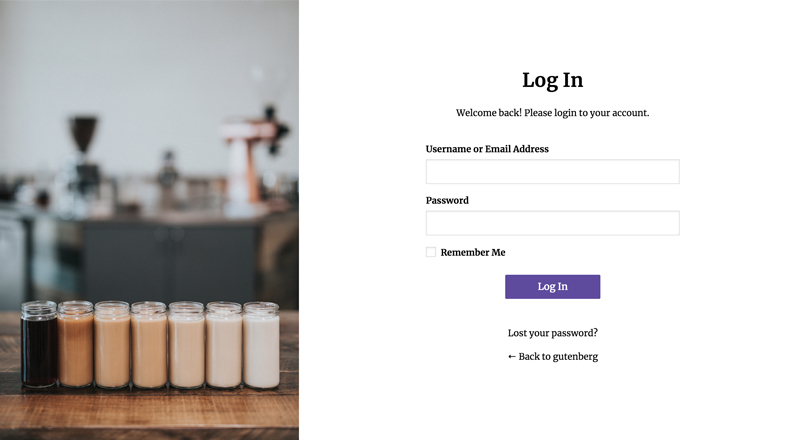 Now enjoy your brand new and elegant login page. If in any case you need more templates and layout selection, please don’t hesitate to check the pro version. Thanks! 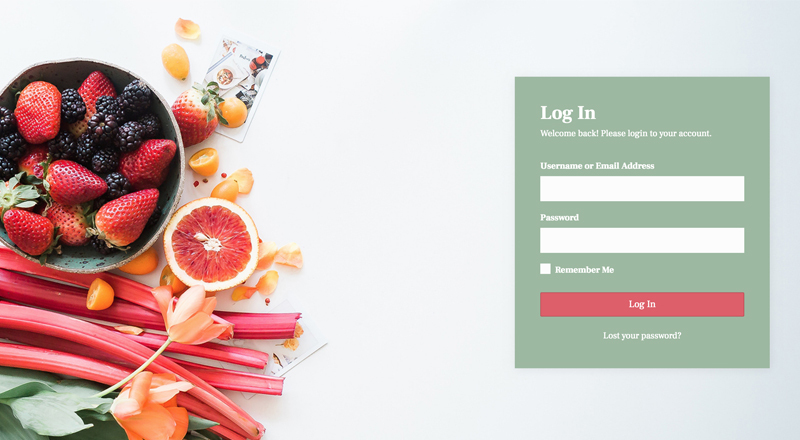 Thousands of website are now transforming their login page to match their branding. 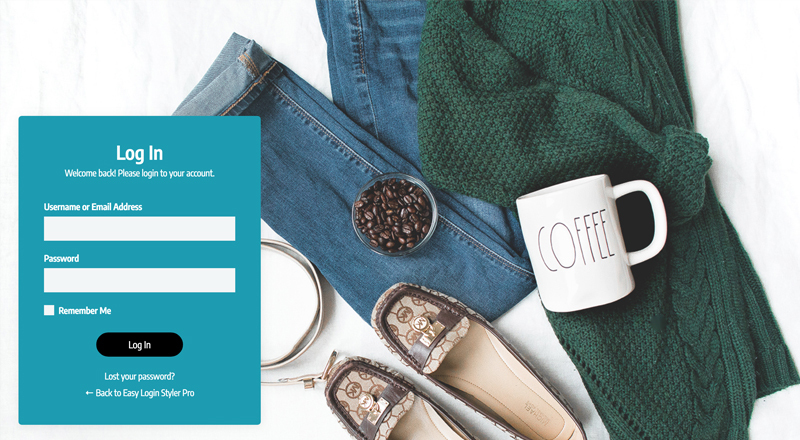 Take your WordPress admin login page now to the next level using Easy Login Styler Pro.